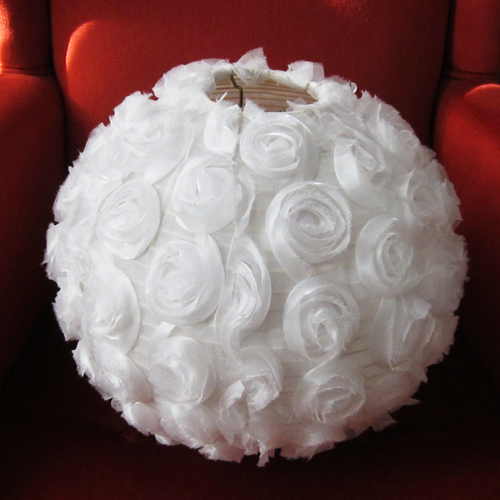 Another simple project to jazz up those boring white Japanese lanterns. 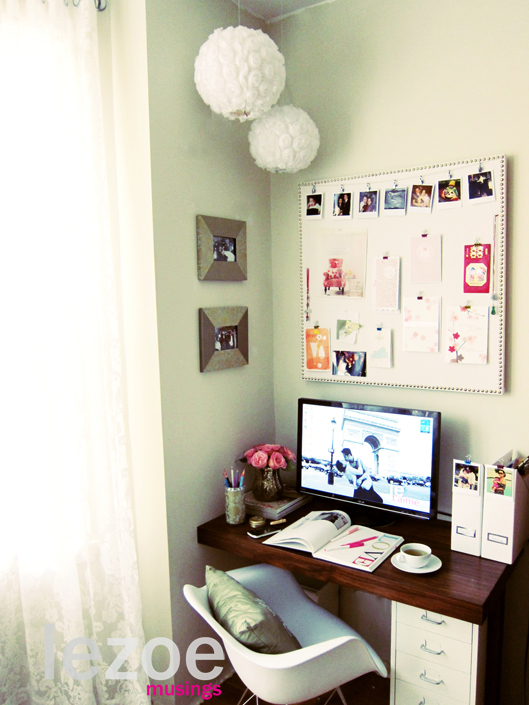 These were seen hung in the picture below from the post An Inspirational Workspace. 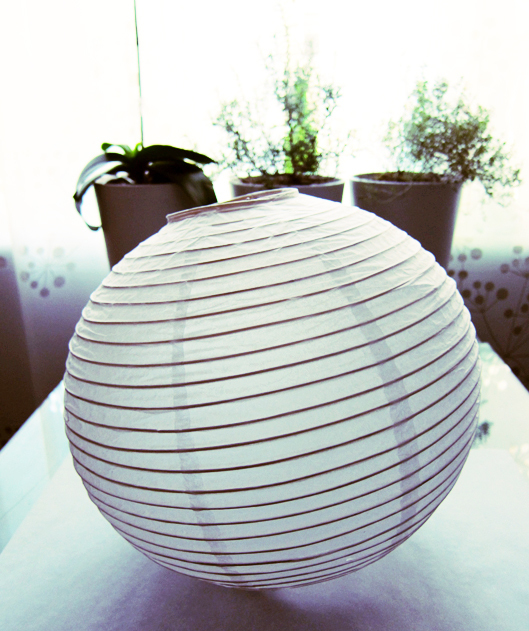 In case you don’t know, this is how a Japanese lantern looks like! 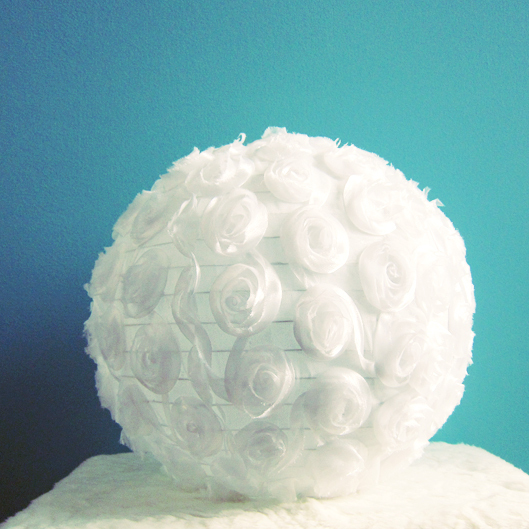 For this project, I got mesh fabric w/ rosette patterns. Mesh is very forgiving for this project b/c it stretches. Also you need a fabric that doesn’t fray, so mesh was a perfect choice. There should be plenty of mesh patterned fabrics at your local fabric store. Basic supplies in addition to glue. I used elmers which worked fine for this project. I don’t recommend glue gun b/c you need room to reposition the fabric in case you mess up. This needs to be done prior to the glue drying. I love this type of tape measure b/c it’s tiny and retracts. Each lantern is constructed w/ several ‘eye’ shaped patterns. 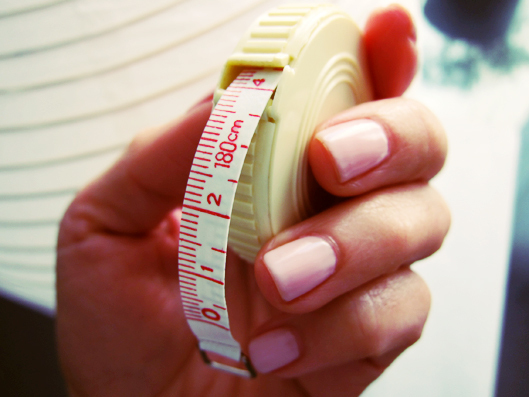 Measure the pattern at several points lengthwise. You are basically copying the pattern onto your fabric. 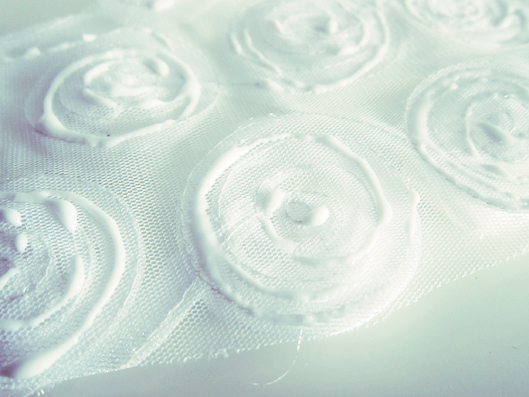 You can also put wax (opaque) paper over the pattern and trace onto the wax paper. 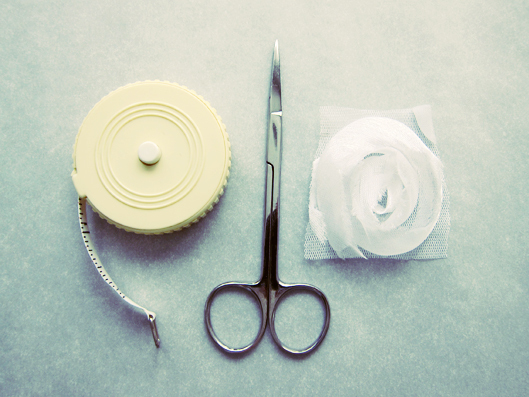 Cut out the pattern on the wax paper and use this as a guide to cut the fabric. 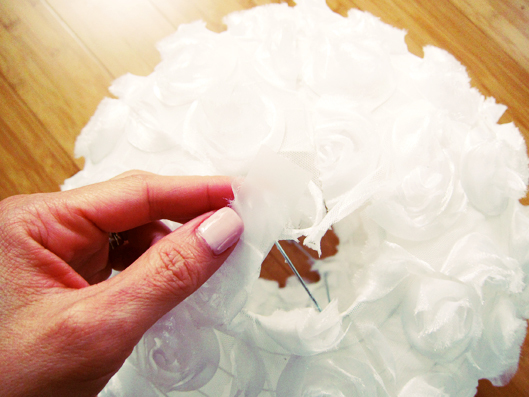 Once the pattern is cut out on the fabric, use glue only on the rosette part of the fabric. This part is thicker so the glue doesn’t bleed through the mesh. 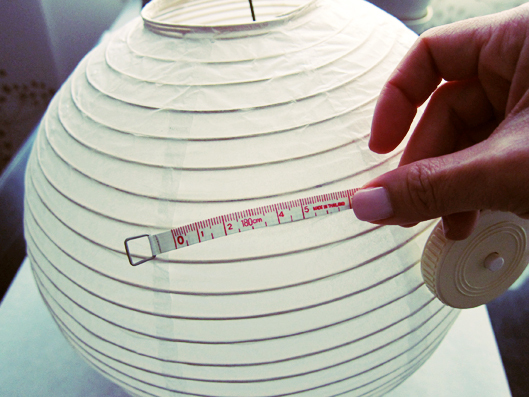 Glue onto the lantern and repeat until you cover the entire lantern. 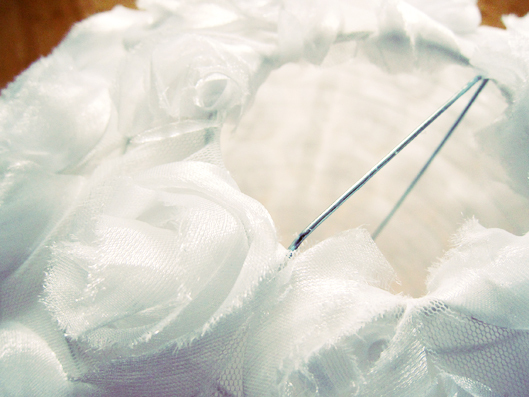 Tape the loose ends into the inner part of the lantern. I used scotch tape so it’s transparent. Both ends should be neatly tucked and taped. That’s all folks! To make it even more spectacular, add lights inside the lanterns. You can make several of these in various sizes, hang them at different heights as a dining ‘chandelier’. Reblogged this on Josh Altarazi Site. What can I say other than…totally gorgeous! Reblogged this on Jason Saric Weblog. Love, love, love these! Thanks so much for the tutorial! Where do you get the lanterns? VEry fun and cool idea!!! I am trying it! 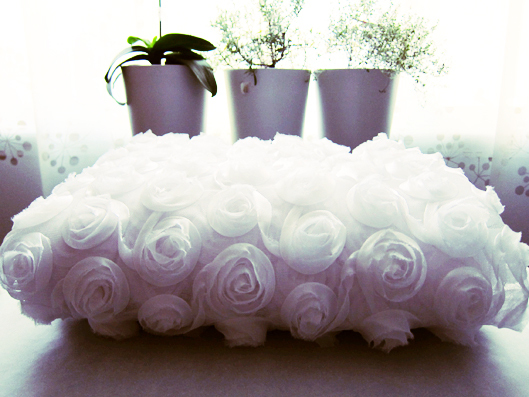 Those are gorgeous and look so much more sophisticated, than the easy DIY you show! I may have to put some of these beauties in my sunroom! These are beautiful! 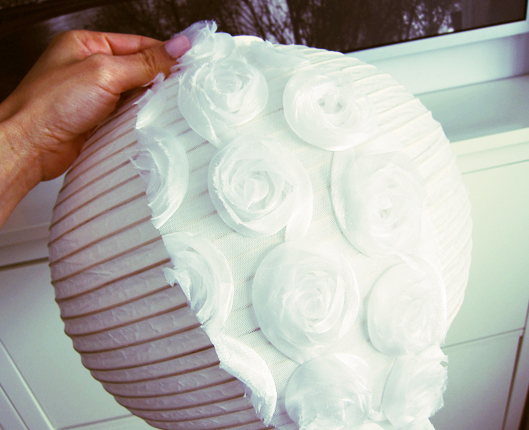 I think I have an yellow paper lantern somewhere, I wonder if I can make something as beautiful with it. Thank you for stopping by in mine. very cool… like that is fabric. Fantastic DIY idea, simple but beautiful! All I can say is: fabulous! Such a great and easy DIY! Will have to try this out! This is a great idea, simple and beautiful. Well done. I love to see metamorphism in action: I always look at things and think:”How can I improve that?” I drive my family mad, my daughter says I have to mess with everything! Love your blog and thanks for stopping by mine: sugarcraftnovice aka Decorous Cakes. Wow – that’s impressive and so pretty. I remember when I used to have more time to do such things … now I get to see other people doing them. Love it! Thanks for stopping by my site…now I know about yours too! LOVE this! I’m inspired. I can’t see myself making it any time soon – but I love that you did — it was fun just watching it unfold! I like your blog too! Saw you also had a post on gardening. Maybe you’ll like this one: http://wp.me/p1Eh63-2D I have another gardening idea I’m going to try and post on soon too! Thank you for visiting and liking us at Previse! These Rose Lanterns are fantastic. So simple, original and chic! I am off to get lost in your archives.. Fantastic! What a beautiful idea. Very nice for a romantic wedding ! The Japanese design sensibility permeates my entire being. I would not be a designer without it. Your rose lanterns light my world! Thank you! + Thanks for stopping by! Best, Kellie. Great DIY yourself idea! In the beautiful nursery you created for you baby girl, I noticed something similar above her crib. Were those done the same way? Reblogged this on I like this.. I love the look of these! I’m moving into a new flat next week and looking for creative ideas to decorate it and make it my own – these might be perfect! I’ll have to show my Fiance. 🙂 Keep on posting! What a great idea! I’ve bought and tossed several of these over the years. A great new way to give new life to these lanterns. Congrats on the quick success of your blog!